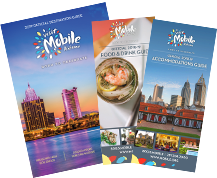 With its first settlers arriving in 1702, the city of Mobile is rich in history. There is no better way to experience that history than to visit the city's beautiful historic homes. See the grandeur of the South and the influences of many different cultures. Mobile's historic homes offer visitors keen understanding of locals' lives long ago. Condé-Charlotte House, which began its life as a magazine and became Mobile's first courthouse and jail, now stands as a museum, full of antiques and colonial and Confederate-era furnishings. The Italianate-style Richards DAR House is known for its cast-iron façade depicting the four seasons and is host to a variety of Revolution-era artifacts. Bellingrath Home, surrounded by the beautiful famed gardens, was built in an English Renaissance-style. If the walls of the Greek Revival-style Bragg-Mitchell Mansion could talk, they would tell stories of Mobile during the Civil War. The Oakleigh complex consists of the Oakleigh Mansion, the Cox-Deasy Cottage Museum and the Minnie Mitchell Archives.